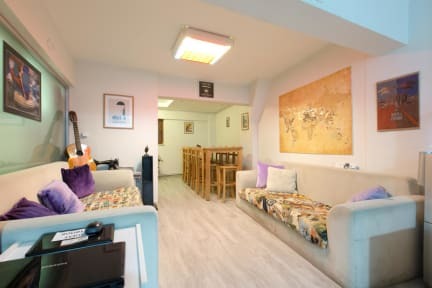 Located in the heart of Izmir, In House Hostel provides help to our guests who would like to visit the surrounding areas (Pamukkale, Ephesus, Cesme, Selcuk). These areas are very near, so you can simply spend the day there and come back enjoying the great nightlife of Izmir and the comfort of In House Hostel. Our building is brand new, warm and perfectly constructed to suit the needs of hostel travelers. We have our common room in the entrance where you can hang out, combined with a kitchen where you can cook/prepare your meals. Up on the top we also have our terrace where you can sit down, relax and hang out. 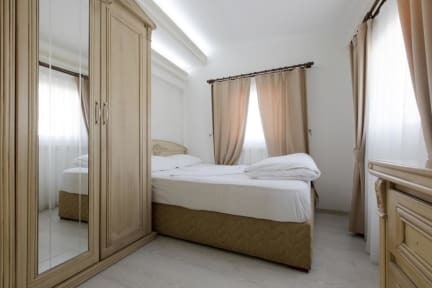 We are right in the heart of Izmir, 3 minutes walk from Alsancak (main train station IZBAN). From 'In House Hostel', you can easily go to the main sights in Izmir, such as the Kordon (coast), Kıbrıs Şehitleri (Main Square) and the Clock Tower in Izmir. The hostel is 2.7 km from Izmir Clock Tower, 600 metres from Ataturk Museum and 1.5 km from Cumhuriyet Square. Izmir Adnan Menderes Airport is 17 km away. We have two 8 bed dorms, one 6 bed dorm and one 4 bed dorm. If you want some more privacy, we have a double(en suite) and a single bed private room. You can leave your luggage in the hostel till you leave for the airport/station. This hostel is the place to be in Izmir. In In-House everything was perfect: comfortable beds, aircon, clean etc. The staff was great and gives helpful advices where to go and what to do. Thank you so much!!! Sehr nettes und hilfsbereites Personal, dass sich um das Wohlergehen der Gäste kümmert. Betten und Bäder waren sauber, Lage ist top und auch Schließfächer vorhanden. Zimmertüren konnte man jedoch nicht absperren. An und für sich trotzdem einen sehr guten Aufenthalt gehabt. Location was great, close to all restaurants and bars and to the beach! Room quite small but ok. Staff was very friendly and helpful. Big kitchen- nice for cooking!